Comic interlude | Thinking is the enemy. Photo by Sam Howzit under Creative Commons. I thought it might be good to follow up my post on reading challenging books by professing my love for comics. One of my earliest memories of reading involves pawing through stacks of old Batman and Spider-Man books at a friend’s house. I must have been 5 or so. The comics belonged to an older brother. My friend and I would watch reruns of the old animated Spider-Man show and read books during commercial breaks. Comics have come a long way since then. 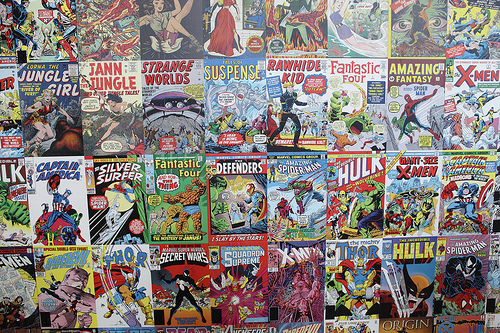 You can still find the same old Marvel and DC titles, endlessly rebooted and recycled. But you can also find ambitious projects like Eric Shanower’s Age of Bronze, a multivolume, meticulously researched retelling of the story of the Trojan War. Or Locke and Key, a six-volume horror masterpiece written by Joe Hill, son of Stephen King, and beautifully drawn by Gabriel Rodriguez. Or Pride of Baghdad, the story of four escaped zoo lions on the streets of war-torn Iraq. Comics are no different from any other narrative form, in that the digital marketplace has been both challenging and liberating. I’ve only just begun to explore the world of Web comics, and there’s a lot of good stuff online. But there’s nothing better than quality paper for quality art. And for me, that means hanging out at my local comics store on a lazy Saturday afternoon. Sometimes I even take a look at Spider-Man — just checking up on an old friend. This entry was posted in Reading and tagged Age of Bronze, Batman, comics, Eric Shanower, Gabriel Rodriguez, Joe Hill, Locke and Key, Pride of Baghdad, Spider-Man. Bookmark the permalink. I remember reading comics, too. Comic books were some of my prized possessions. I wasn’t aware of the the Age of Bronze, Locke and Key, or Pride of Baghdad, but it definitely sounds like they are worth a look. Neat stuff. Are you into graphic novels at all? I hear there are some great ones. Having said all that, it’s been a long time since I bought individual, serialized issues. I’d rather wait a few months and buy a complete volume of several issues in trade paperback form. Usually one volume of several issues constitutes a complete story arc, anyway. And then there are long-form comics (Like “Pride of Baghdad”) that were never serialized, and I read those too. It’s all comics to me. Gotcha. Thanks for that info. I was unfamiliar with where people stand on the distinctions. Gaiman’s Sandman is one of the ones that came to mind when I thought of graphic novels I’d heard good things about.